The annual convention is approaching and the American Psychiatric Association (APA) has decided to train a few psychiatrists from each district branch to teach about the new DSM5. They think that is sufficient to fill the demand from organizations and groups who want assistance with DSM5 training and implementation. They also think that the threat of litigation is enough to protect the DSM copyright and prevent other self declared trainers from going around the country and training people about the DSM5. That is more critical than you might think. Let me explain why both of these thoughts are problematic wrong and describe a more optimal course of action that could still be implemented before the May convention. First of all let me say that the ideas I am posting here are not new. I have inquired directly from the APA as a member both at their Washington Offices and through my District Branch (DB). The lack of response prompted the “Crickets” title from the APA because cricket chirping is about all I am hearing about any initiative other than the APA’s original plan. There are many sources of failure possible by restricting the training. The obvious one is that psychiatrists are busy. The failed billing and coding system generally means that psychiatrists are seeing a lot of patients and spending even more time on billing, coding, and documentation. That leaves very little time each week to study for recertification exams, train future psychiatrists and medical students, and participate in other professional activities. Given how thin psychiatrists and other physicians find themselves spread, it might be reasonable to have a bureau of trained DSM5 experts at each DB to cover the potential demand. I first got interested in this issue when a large health care organization asked me about the availability of consultants to assist them in their nationwide implementation. The DSM IV is currently implemented in their electronic medical record (EMR). Several calls directly to the APA did not produce any results. I identified myself as a member and that did not make a difference. I contacted my excellent DB Executive who I had worked with during my term of being the DB President. She is extremely knowledgeable and widely networked within the organization. The question I proposed was whether the APA would consider opening up the convention session to all psychiatrists through the DB and certifying anyone who has taken the course. Still no response. 1. Expand the training in May to all DBs and to as many psychiatrists as want to take the training. 2. Provide password access to all of these psychiatrists to the DSM5 web site for the purpose of ongoing learning. The DSM5 site was quite good in providing the rationale for suggested changes and prospective trainers could benefit from ongoing access to this material. 3. Provide educational materials (PowerPoints) to all of the trainers through access to a training web site. 4. Develop a course specific to administrators and companies who need IT implementation information and have that readily available. 5. License DSM5 to corporations in the same way that psychiatrists with online subscriptions can access it. UpToDate has provided a good example of the continuously updated online reference rather than serial textbooks being the direction forward. There should be no need for update cycles and massive political events to herald updates. The DSM and all psychiatric guidelines need to be systematically reviewed and updated if APA technology is to be seen as the definitive reference for the biomedical diagnosis and treatment of major mental disorders. Updating every 10-20 years will not survive in the day of Internet technology. There is also a lot less drama involved when UpToDate updates its content. That is consistent with being a resource for physicians and by physicians. All of these recommendations can be done and anything less than following through on these recommendations leaves the APA seriously compromised and not competitive in the future. Side Effects may qualify as a new level of antipsychiatry film. I went to see this film last night with a vague notion that it was a thriller with some surprise plot twists and that it may have something to do with psychiatry. I walked out one hour and 46 minutes later with the impression that I had seen an antipsychiatry movie on a grander scale than previously observed. My previous standard was the psychiatrist who happened to be a serial killer and cannibal. The psychiatrists portrayed in this film were not as aggressive but certainly had their fair share of criminal activity, unethical behavior, and boundary violations. The sheer scope of that behavior was striking. The plot unfolds as we get to know Emily Taylor (Rooney Mara). She appears to be depressed and even suicidal at times. This depression occurs in the context of significant life stressors including the incarceration and subsequent release of her husband Martin (Channing Tatum) for securities fraud. There is an overall impression that the couple lost quite a bit of status and financial resources as a result of that problem. We see her struggling at work and eventually intentionally injuring herself. That leads to her initial encounter with Dr. Jonathan Banks (Jude Law). Dr. Banks initiates treatment with antidepressant medication and Emily seems to be experiencing intolerable side effects from the initial SSRIs. In the meantime, Dr. Banks is in touch with Emily's previous psychiatrist Dr. Victoria Siebert (Catherine Zeta-Jones) who suggests a new recently approved antidepressant. Emily takes this new medication and appears to be experiencing even more side effects right up to the point that she kills Martin while she is apparently “sleepwalking” as a medication related side effect. From the initial perspective, it seemed like a heavy-handed “psychiatrists corrupted by Big Pharma” film until that point. After all Emily seems to be clearly made ill by the drugs and that point is emphasized cinematically by slowing down the entire scene in what seems to be her drug addled perspective. Her psychiatrist seems indifferent to the problem and the fact that her spouse is getting more angry about the situation. At one point the representative of a pharmaceutical company offers to pay Dr. Banks a considerable sum of money for doing research on the new antidepressant. There is a suggestion that Dr. Banks is already spread too thin. In that same scene, the representative emphasizes that she can buy psychiatrists meals and they banter about consulting fees. Dr. Siebert hands Dr. Banks a pharmaceutical company branded pen with the name of the new drug printed on the side. The sum of the cinematic effect at that point is to suggest that antidepressants are very toxic drugs, psychiatrists inflict more problems on people with these drugs, and that psychiatrists essentially prescribe these drugs because they are pawns for Big Pharma. Admittedly nothing more than you might read in the Washington Post. The plot lurched forward at that point to the issue of a not guilty by reason of insanity defense and the interactions of Dr. Banks with his patient even after she was sent away to a forensics facility. There was also considerable emphasis on the interaction between Dr. Banks and Dr. Siebert. I will try to point out problems that occur along the way without giving away the rest of the plot. The first problem at that point in the movie was both the defense attorney and the prosecuting attorney suggesting that Dr. Banks should consult for their side. The fact that Dr. Banks has a treatment relationship with Emily makes his consulting with either side a clear conflict of interest, even in a non-criminal matter. He continues to see Emily at the state forensics facility. At that time he is seeing her only to advance his interests and they no longer have a therapeutic relationship. He threatens her, essentially blackmails her, and administers a questionable treatment in an unethical manner. We later learn that Dr. Siebert also has an inappropriate relationship with Emily and has been involved in criminal activity with her. At one point, Dr. Siebert attempts to ruin Dr. Banks’ professional reputation and relationship with his wife by releasing a letter from a former patient and manipulated photographs of Dr. Banks and Emily. His partners react strongly and fire him from their practice. An investigator from the state medical board seems suspicious of Dr. Banks. Part of this side plot seems to be the only plausible aspect of this film and only insofar as complaints against physicians and psychiatrists are common and greatly outnumber the incidence of inappropriate physician behavior. The reaction of Dr. Banks’ partners to this material as well as an adverse outcome is overdone. Any psychiatrist treating people with severe mental illnesses has adverse outcomes. Most reasonable people agree that an adverse outcome in medicine and psychiatry does not imply either negligence or criminal intent. I am generally focused on the purely cinematic aspects of any film that portrays psychiatrists. I explained my rationale for this approach in a previous review. My approach is based on the low likelihood of seeing an accurate cinematic portrayal of a psychiatrist. I imagine that other professionals have the same experience. The problem with this film is that the actions of psychiatrists are the major part of the plot and it is difficult to focus on the motivations and personalities of the other characters. The character of Emily is not developed very well and her actions are difficult to understand. Dr. Banks and Dr. Siebert are certainly much more active but their de novo sociopathy and unethical behavior have no context. This lack of character development, dominant scenes by psychiatrists, and the implausibility of those scenes makes this a difficult film to watch. Regarding the entire issue of why I referred to this as an anti-psychiatry movie that is based on the classification from the Oxford Textbook of Philosophy and Psychiatry. It can be found in the footnote to this post (reference 2). This film is a good illustration of the biomedical psychiatry as political control cliché. The psychiatrists in this film are unhindered by any legal, ethical, or professional barrier in promoting their own self interests. Their obnoxious behavior seems on par or worse than the actual crimes that were the focus of the story line and seems to be more than the typical antipsychiatry bias that is expected in the media. The psychiatrist as bogeyman is alive and well at the cinema. The run on guns and ammunition - is this mass psychogenic illness? I was watching my usual Sunday morning news programs two weeks ago when I heard that Wal-Mart had such a run on their ammunition supply customers that they were limiting sales to three boxes per customer per day. That brings up the image of tens of thousands of people going to Wal-Mart every day to buy their three boxes of ammo. What is it about the American psyche that drives this behavior and the recent stockpiling of guns? It reminded me of the Y2K situation from over a decade ago. Do you remember that scenario? In the antithesis of the Terminator series, computers would be crippled by inadequate programming to account for the change to the 21st century. The power grids would collapse. The logistics of food and medical supplies would be paralyzed. There would be chaos in the streets. In Minnesota in the middle of winter that translated to a run on electrical power generators. It got to the point that one of the big home stores cancelled their return policy for generators. I never noticed it but I wonder if the generator aisle at the Home Depot ever looked like this gun shop display. Another perspective comes from the Bureau of Alcohol, Tobacco, Firearms, and Explosives. They keep a record of firearm manufacturing in the US by the type of firearm and also whether or not a firearm is exported. The data going back to 1998 is available on their web site. I plotted that data for rifles, pistols, revolvers, and shotguns on the following graph. 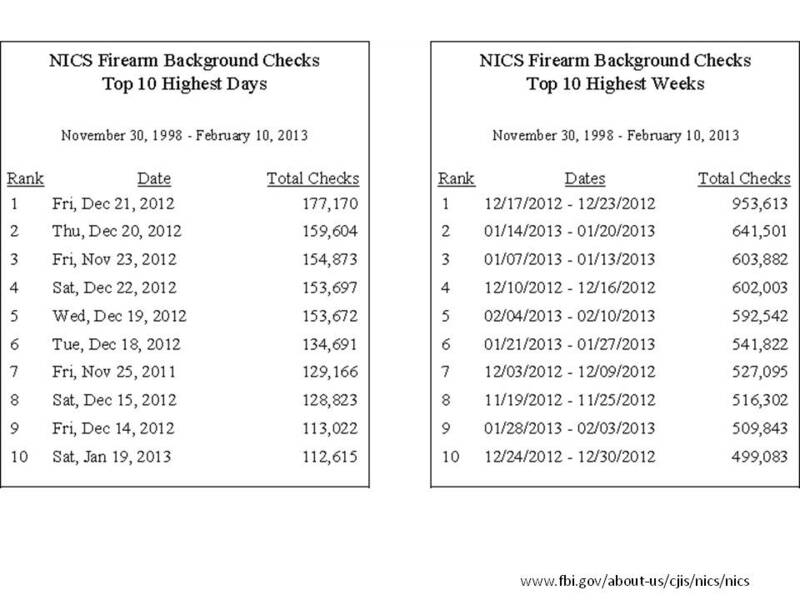 Some interesting trends noted include the fairly recent increase in rifle production. There were relatively flat revolver and shotgun sales, and a sharp increase in pistol production over the past decade. The year 2004 is also an interesting inflection point for rifle sales since that was the year that the ten year ban on assault rifles expired. Without knowing the exact breakdown of rifle sales, the rise at that point combined with flat rate of shotgun sales suggests that the rising rate represents sales of assault rifles or military style weapons that are not necessary for hunting. 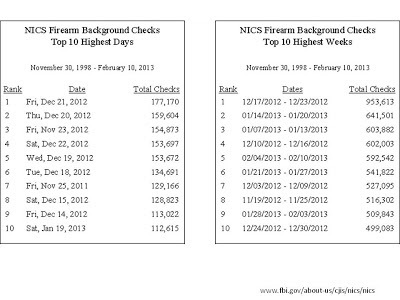 All of the signs point to a greater prevalence of guns in homes and communities especially hand guns. 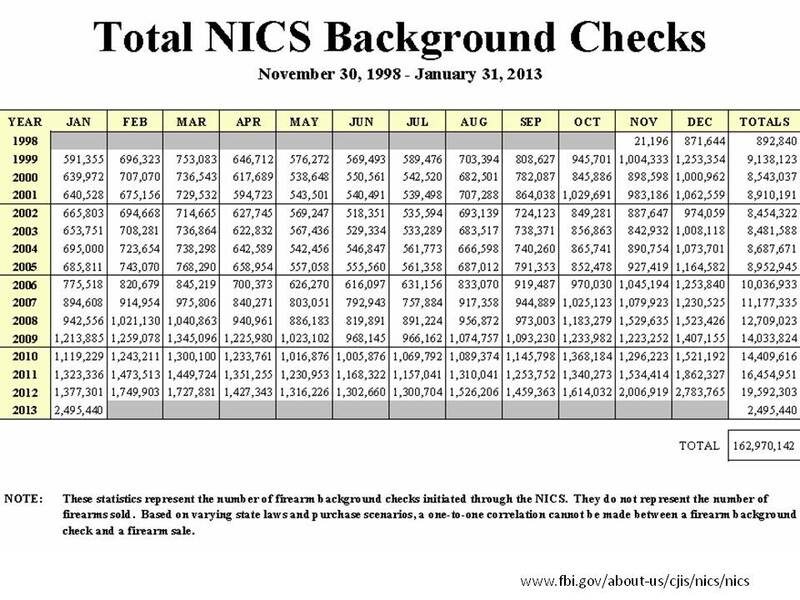 Not only that but it appears that Americans are arming themselves at a much higher rate than at any time since we started to keep these statistics. They also appear to be arming themselves using handguns and possible military style weapons that are not typically used for hunting. Hunters are frequently mentioned in NRA and pro-gun rhetoric but they certainly are not responsible for the huge increase in hand gun sales. If we are ruling out hunters who is buying the guns? 1. Protect yourself against violent criminals (even though there are fewer of them and they seem to be committing fewer violent crimes than at any point in the past 30 years). 3. Protect yourself against the government. This is an interesting argument because it basically is the same thing as treason. When I argued that point with a famous gun advocate he pointed out that it would depend on "who won". Some conservative and liberal politicians of both parties have made this argument, including Minnesota's well known liberal Senator Hubert H. Humphrey. The basic argument is that if the government becomes completely unresponsive to the people for one reason or the other - we should have enough firepower to overcome it. I guess if we can't vote the bums out - there is always another way. 4. Protect yourself against your neighbors. This is the survivalist argument. The survivalists believe that we are always "9 meals away from chaos". It is therefore logical to stockpile food. When the apocalyptic event happens, you need enough guns and ammo to shoot anyone who threatens you or your food stockpile. 5. Protect yourself against the zombies. That's right - you thought the zombie apocalypse was just fiction. I happened to catch an episode of Doomsday Preppers that was full of information ranging from how zombies might scientifically happen to staircase design that would slow them down long enough so that you could administer the old "double tap". An inspection of the above list suggests that there are many more imagined than real threats. Possibly several orders of magnitude greater if you are considering that all of your neighbors who ignored your warnings about the apocalypse are either coming for your food or have contracted the virus that turns them into zombies and want to eat you for food. In that scenario - how much ammo is enough? All of this would be more fodder for the film industry if it was not true at some level. Very few real threats and many imagined would seem to be driving the current gun buying frenzy. After all - what would happen if any of the mass scenarios unfolded and we did not have enough guns and ammo? I don't want to go too far out onto a limb here. For all of you DSM5 detractors - don't worry there is no diagnostic category to critique. I think that there is room for studying the problem, but it would involve collecting data from the gun purchasers and we all know that would not fly. Anyone knows that if you can be identified - the government can kick your door down and take your guns. 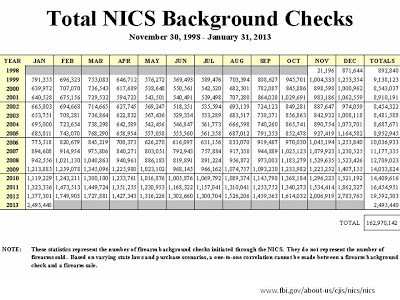 FBI Instant Background Checks November 30, 1998- January 31, 2013. ATF Annual Firearms Manufacturing Report and Export Report 2011. This post was inspired by a post on the Neuroskeptic. The impression I get from that blog is that the average reader thinks that psychiatrists are a bunch of chuckleheads who know very little and that is probably why they are so ignorant of science. The Neuroskeptic himself seems to be slighlty more tolerant but like most bloggers he has to stir the pot. The focus of this post was to take a look at kappa statistics given in the article by Freedman on DSM5 field trials and a graphic supplied by the boringoldman blog and conclude that DSM5 reliabilities were not good, they were not as good as DSM-IV, and thankfully psychiatrists could just ignore the DSM if they wanted to. On the face of it all this seems like damning criticism. Is there any defense from the neuroscientific opinion? It turns out that there is and it comes from two sources. The first is the common experience that most people have had who have any medical diagnosis in their lifetime. Were you ever misdiagnosed? Did you ever get a second opinion and find that the diagnoses by both doctors were so far apart that it was difficult to make a plan to address the problem? I can give you one of many examples from my lifetime. When I was a second year medical student I had several incidents of ankle pain. I was assessed and ended up at an orthopedics clinic. I had my ankle casted a couple of times, even though I had no history of trauma. I finally woke up one night with excruciating left ankle pain and went to the emergency department. I saw orthopedics again and they aspirated the joint. They also asked my wife to leave and asked me if I had possibly contracted gonorrhea somewhere. I was given acetaminophen with codeine and discharged after about 8 hours. A couple more weeks of pain and I finally got in to see one of the top experts in Rheumatology who finally made the diagnosis of gout. At that point I had seen 4 or 5 other doctors and none of them had been able to correctly diagnose the cause of my ankle pain. Calculating a kappa statistic for a comparison between the expert and the previous physicians would have resulted in a very low number. But the story doesn't end there. As anyone with gout knows, it has varied presentations including inflammation that often seems to extend outside of the joint. During my residency training a few years later I had acute right wrist pain. The internist I saw decided he needed to aspirate my wrist joint and ended up aspirating a piece of the wrist joint into the syringe. No diagnosis despite this procedure. I demanded treatment for gout and of course it worked. Several recurrences of wrist pain have resulted in misdiagnoses of cellulitis. Keep in mind that I am not testing these doctors. I am presenting to them and telling them I have gout and I think my wrist pain is an acute gout attack. They are saying: "Well gout doesn't usually affect the wrist. I think this is cellulitis." I have walked out of clinics and thrown the prescription for antibiotic away as I walked out the door. I finally just got a supply of the anti-inflammatory medication that I need and treat these episodes myself rather than risk misdiagnosis by a physician who does not know much about gout. You could say this is all anecdotal. I have more anecdotes about how I have been personally misdiagnosed and the anecdotes of an additional thousand people at this time. I heard Ben Stein say: "At some point the anecdotal becomes the statistical" and this is a good example from medicine. But what does the literature say about the reliability of diagnoses. The diagnostic criteria for gout have been around longer than the DSM. Another frequent criticism of psychiatric diagnosis is that there are no confirmatory tests for the diagnosis. Numerous confirmatory tests for gout did not prevent misdiagnosis in my case. Ensari A, et al. Serrated polyps of the colon: how reproducible is their classification? Virchows Arch. 2012 Nov;461(5):495-504. doi: 10.1007/s00428-012-1319-7. detection features. J Cardiovasc Comput Tomogr. 2012 Sep-Oct;6(5):335-45.
ten Dam L, et al. Reliability and accuracy of skeletal muscle imaging in limb-girdle muscular dystrophies. Neurology. 2012 Oct 16;79(16):1716-23. Collins SP, et al. A comparison of criterion standard methods to diagnose acute heart failure. Congest Heart Fail. 2012 Sep-Oct;18(5):262-71. What jumps out at you from the table? The kappas from other specialties are widely variable and certainly no better than criticized values from psychiatry. The fact that some of these kappas are based on interpretations of more uniform test data (radiology images or pathology specimens) seems to make little difference. Low interobserver consensus seems to be the rule rather than the exception in medicine. Psychiatry is the only specialty that openly admits this. Misdiagnosis is a universal phenomenon and I would argue that it is a basic element in the process of medical diagnosis. Some have referred to it as the "art" of medicine, but I prefer a more scientific explanation. From a neurobiological standpoint there is certainly the phenomenon of significant variability between people. Medicine from the outset has always presented itself to practitioners as a field where rational analysis produces a logical result. With the degrees of freedom inherent in biological systems that degree of certainty is an illusion at best. Pretending that psychiatry is less reliable than any other field is an equally problematic illusion, but I guess it makes for good rhetoric. Maclure M, Willett WC. Misinterpretation and misuse of the kappa statistic. Am J Epidemiol. 1987 Aug;126(2):161-9. Review. PubMed PMID: 3300279. Yoshizawa CN, Le Marchand L. Re: "Misinterpretation and misuse of the kappa statistic". Am J Epidemiol. 1988 Nov;128(5):1179-81. PubMed PMID: 3189294. Silver Lining Playbook - Propsychiatry? I went to see this film today for a couple of reasons. Several people recommended it to me as a “pro-psychiatry” movie. And I saw Robert De Niro interviewed about this movie with some of the cast and he was overcome with emotion and attributed it to the main character of the story and what he apparently went through with bipolar disorder. As a film the structure and pace of this are well done. It is enjoyable to watch. The ensemble cast of Bradley Cooper, Jennifer Lawrence, Robert DeNiro and Jackie Weaver are focused at times on how depression and bipolar disorder affect people and their families. I think it is generally known that the film focuses on Cooper’s character Pat, at the outset. We learn that he has been court ordered to a psychiatric hospital. In one of the opening scenes his mother picks him up and drives him to home to Philadelphia where he is supposed to comply with court ordered therapy, medications, and the conditions of a restraining order that prohibits him from contacting his wife or coming within 500 feet of her. A police officer shows up to encourage compliance with the restraining order. The first question in evaluating the movie and my friends’ comments is whether this very entertaining and well acted film is psychiatrically plausible. Could the Cooper character (Pat Solitano) assault someone with the vigor we see in the film and end up being diverted to what appears to be a low security state psychiatric facility. My understanding is that the film is based on the novel The Silver Linings Playbook by Matthew Quick. There seems to be a general consensus that the film version is a very loose adaptation so I suppose I would need to read the novel to see the way this part of the plot was framed. In real life, assaultive behavior in most states is handled as a criminal matter rather than court ordered psychiatric treatment. It is one of the reasons that county jails have become large psychiatric facilities. In some cases there is psychiatric care provided in jail. In more enlightened systems competency evaluations are provided in jail and that may result in diversion to mental health court rather than criminal court. An insanity plea has a low likelihood of success and defense attorneys are reluctant to consider it because the length of stay in a psychiatric hospital may be longer than in jail. In this case Pat has been in the hospital for about 8 months. We are told his mother made some kind of a deal to get him out. In the process, one of his fellow patients leaves in the same car illustrating that security is not a priority. While he is in the hospital, Pat spits his medication out after a mouth check by a nurse and when he gets home he proclaims he is not taking the medication because it affects his mental clarity and gives him physical side effects. He is intense, wakes his parents up in the middle of the night, and creates a high level of tension in their home. His parents seem at a loss in terms of how they can help him and invariably end up reminding him about the conditions of his release. His apparent mental illness peaks with a scene where the entire neighborhood is disrupted and he physically injures his parents. He eventually begins taking the medication. His relationship with Tiffany (Jennifer Lawrence) begins in parallel with his initial stability and proceeds as he is getting more stable. She also discloses a significant depression associated with her husband’s death and some sexual promiscuity. She is portrayed as a very intense and at times angry and agitated women who is aware of the controversial parts of her character and says she has accepted them. She has several angry confrontations with Pat and a very animated confrontation with his family about whether or not she is good for their home team’s juju. Her emotional relationship to Pat as he recovers is one of the most compelling parts of the film. At various moments, Pat is seen with his psychiatrist Dr. Patel (Anupam Kher) who does a good job of engaging a hypomanic Pat in movie psychotherapy. Dr. Patel did have qualities that most people would like to see in a physician. He listened, he was engaged, and he was able to relate to Pat. In the first clinic scene, we learn that Dr. Patel played some music (or said that he did) to see how Pat would react. Pat trashed the magazine stand in the waiting area. This is dramatic license rather than actual psychiatry. I can’t imagine any reasonable psychiatrist who would be eager to provoke a reaction from a person with a history of aggression who has been conditionally released from a state psychiatric facility. The reality of these appointments for people with severe mental illnesses is that most of the time is not focused on psychotherapy. In most public or managed care clinics Dr. Patel would have about 20 minutes to see Pat, discuss his symptoms, discuss medication side effects, order and review labs, and do the necessary documentation. A casual armchair conversation like the one portrayed in the movie can occur only in special circumstances. After the initial sessions we next meet Dr. Patel tailgating in the parking lot outside of the Philadelphia Eagle’s game. He embraces Pat and utters a word that I have never heard a psychiatrist say. There is an ugly scene involving racism and Dr. Patel and his fellow Indians and some of the locals. Pat is back in the middle of this fighting to protect his brother. Although he is arrested they all (including Dr. Patel) end up back at Pat’s parents home – a significant boundary problem. I think that it is pretty obvious that I don’t really see this as a “pro-psychiatry” movie. Psychiatrists don’t really act like Dr. Patel and many of the scenes highlighting problems with mental illness are more probably affected by dramatic license. Some of those scenes were well done in terms of the chaos, aggressive behavior, anger and stress associated with mental illness. Critics have faulted the film for not going far enough diagnostically, being an antipsychiatry film in that it demonstrates the failures of medical psychiatry, and generally seeing it as a random display of neurosis without enough details. I think the outlines are there, but let’s face it. This is not a clinical exercise. This is art. When I go to the movies, I am looking for compelling characters and good acting. It is even better if those characters are acting out a fantasy that I can identify with. Cooper and Lawrence clearly have a level of intensity that you don’t see in many places these days. So while this film was really not about psychiatry (certainly not “pro-psychiatry”) it was very entertaining and it captured a lot of the reasons why I go to the movies. I would like to have read what Robert De Niro read that gave him insights into the pain of the main character. From what I saw today, they only scratched the surface on that issue. This article came to my attention this week from the New York Times blogs. The author identifies himself as a philosophy professor and scholar who is an expert in French philosophy. He presents some viewpoints of Foucault and others to criticize the DSM and of course the clinical method in psychiatry. I will be the first to admit his initial argument is confusing at best and is based on Foucault’s observation: “What we call psychiatric practice is a certain moral tactic….covered over by the myths of positivism.” Indeed, what psychiatry represents as the “liberation of the mad” (from mental illness) is in fact a “gigantic moral imprisonment.” In the next sentence the author acknowledges: "Foucault may well be letting his rhetoric outstrip the truth, but his essential point requires serious consideration." He gives examples of the previous treatment of homosexuality and women and uses this as a platform for suggesting “….there’s no guarantee that even today psychiatry is free of similarly dubious judgments.” With no credit given to Spitzer’s role in both the DSM and eliminating homosexuality as a mental illness back in the 1970’s (where is the rest of America on that issue even today?) he latches on to the bereavement exclusion as the latest example of how psychiatrists are trying to dictate how people live and how various nonphysicians are better equipped to decide about whether the bereavement exclusion should be left in place. Like every other commentator he waxes rhetorical himself using the well worn descriptor “medicalization” and suggesting part of the motivation for these changes is pressure from the pharmaceutical industry. I recently posted a response to a less well written criticism from the Washington Post that addresses these issues and I would encourage anyone interested in finding out what is really going on to take a look at that post. The critics never acknowledge that like all physicians, a psychiatrist’s role is to treat illness and alleviate suffering. Further, the clinical method in psychiatry is the only specialty training that emphasizes clinical neutrality and recognizing emotional and intellectual biases that impact the physician patient relationship and offers ways to resolve them. That is hardly a model for forcing value judgments about preferred mental states on people who other physicians are frequently unable to treat because of their own value judgments. The author also erroneously concludes that it is dangerous to make psychiatrists “privileged judges of what syndromes should be labeled mental illnesses” based on the fact that “they have no special knowledge about how people should live”. Since psychiatrists do not make that claim, and since various groups including governments and religious institutions have been making these judgments for centuries with very poor results, I would suggest that psychiatry has had some problems – but the progress here is undeniable. That makes psychiatrists experts in their own field in their own field and the purveyor of their own diagnostic methods and not a claim that people should live in a particular way. DSM-IV takes pains to point out that it is classification system for syndromes and NOT people. The DSM is not designed for an untrained person to look at and make a diagnosis or get guidance for living. It is designed to be a common language for psychiatrists who have all had standardized training. I would also like to suggest that the same philosophical criteria be seriously applied by philosophers to the pressing problems within the health care system. The DSM is not even a gnat on that landscape. We have had nearly 30 years of active discrimination by governments and insurance companies against persons with mental illness. While much criticism has been heaped on the bereavement exclusion criteria, people with addictions and serious mental illnesses are routinely denied potentially lifesaving interventions. This discrimination has been well documented and it has fallen disproportionately on the mentally ill. Jails and prison have become de facto mental hospitals. People are being treated with addicting drugs on a large scale to the point that many consider opiate use and deaths from overdose to be an epidemic. Governments save money and pharmaceutical companies and the managed care cartel prosper. Contrary to the author’s suggestion that “psychiatrists are more than ready to think that just about everyone needs their services” psychiatrists are rare and access is strictly controlled by managed care companies and the government. Even if a person sees a psychiatrist, their medications, access to psychotherapy, and access to hospital treatment are all dictated by a business entity rather than their doctor. It would seem that philosophers could find something to critique in that glaringly bleak health care landscape other than a trivial change in the diagnostic manual of a vanishing medical specialty. If not, I would be very skeptical of their arguments. Gary Gutting. Depression and the Limits of Psychiatry. New YorkTimes February 6, 2012. Shorter E. A History of Psychiatry. John Wiley & Sons, New York, 1997: 302. I was a fan of big data before it became fashionable. I was a high tech investor before the dot.com bubble and became very interested in high speed networking, especially the hardware necessary to move that data around. Even before that information was publicly available, electrical engineers were using that equipment to rapidly download large amounts of data (GB) from satellites on every orbit. As an investor, one of the early flagship applications was large telescopes. I wrote an article on high speed networks and the medical applications - digital radiology and medical records back in 1997. At about the same time I made the information connection. As a college student, I got my hands on the Whole Earth Catalog. That led me to my small college library and my surprise to find that they had Shannon's seminal work on information theory on the shelf. I was even more excited when I learned about entropy in my physical chemistry course three years later. Since then I have been searching without much success to look at what happens when two people are sitting in a room and talking with one another. My entire career has been spent talking with people for about an hour and generating a document about what happened. It turns out that the document is stilted in the direction of tradition and government and insurance company requirements. It covers a number of points that are historical and others that are observational. The data is basically generated to match a pattern in my head that would allow for the generation of a diagnosis and a treatment plan. The urgency of the situation can make the treatment plan into the priority. The people who I am conversing with have various levels of enthusiasm for the interaction. In some cases, they clearly believe that providing me with any useful data is not in their best interest. Others provide an excessive amount of detail and as the hour ends I often find myself scrambling to get to critical elements before the hour expires (my current initial interview form has about 229 categories). This basic clinical interview in psychiatry has been the way that psychiatrists collect information for well over a century. In the rest of medicine, the history and physical examination has become less important due to advances in technology. As an example, it is rare to see a cardiologist these days who depends very much on a detailed physical examination when they know they are going to order an echocardiogram and get data from a more accurate source. In psychiatry, other than information from a collateral interview and old records there is no more accurate source of information than the patient. This creates problems when the patient has problems with recall, motivation, or other brain functions that get in the way of describing their history, subjective state, or impact on their life. The central question about how much useful information has been communicated in the session, the signal-to-noise considerations, and what might be missing has never been determined. The minimal threshold for data collection has never been determined. In fact, every information specialist I have ever contacted has no idea how these variables might be determined. Information estimates have become more available over the past decade ranging from estimates of the total words spoken by humans in history to the total amount of all data produced in a given year. Estimates of total words ever spoken range from 5 exabytes to 42 zettabytes depending on whether the information is stored as typewritten words on paper or 16-bit audio. That 8,400 fold difference illustrates one of the technical problems. What format is relevant and what data needs to be recorded in that format? The spoken word whether recorded or typed is one channel but what about prosody and paralinguistic communication? How can all of that be recorded and decoded? Is there enough machine intelligence out there to recognize the relevant patterns? That means that the SKA is nearly producing the total amount of information spoken by humans (recorded as 16-bit audio) in recorded history every year. The author points out that the SKA will produce 700 TB of data per second and within a few days will eclipse the current size of the Internet! All of this makes the characterization of human communication even more urgent. We know that the human brain is an incredibly robust and efficient processor. It allows us to communicate in unique and efficient ways. Even though psychiatrists focus on a small area of human behavior during a clinical interview the time is long past due to figure out what kind of communication is occurring there and how to improve it. It is a potential source of big data and big data to correlate with the big data that is routinely generated by the human brain. Dawson G. High speed networks in medicine. Minnesota Physician 1997. Lyman, Peter, H. Varian, K. Swearingen, P. Charles, N. Good, L. Jordan, & J. Pal. 2003. How Much Information? Berkeley: School of Information Management & Systems. Mattmann CA. Computing: A vision for data science. Nature. 2013 Jan 24;493(7433):473-5. doi: 10.1038/493473a. Shannon CE. A mathematical theory of communication. The Bell System Technical Journal 1948; 27(3): 379-423. I thought I would wade in on this issue largely because I am not hearing a lot of rational discussion about the problem. You might ask: "What does a psychiatrist know about this issue?" and the answer like most questions about psychiatry is "plenty". I worked on a busy inpatient unit for 22 years and saw plenty of people with with severe chronic pain and episodic pain crises. In that same facility, I also covered consults on medical and surgical patients many having problems with chronic pain and addiction. As an addiction psychiatrist, I have talked with countless people who ran into problems with pain medications or relapsed to using another drug after being exposed to opiates for treatment of acute or chronic pain. There seems to be very little reality based information out there to inform people about the risks and benefits of pain treatment with opiate medication. The argument like most in our society is politically polarized to those who believe it is unconscionable to not treat pain even if it means a long course of opioids to those who believe that opioids are dangerous medications that should be conservatively prescribed. So where does the truth lie? I can tell you how it was in Minnesota in the 1990's. There were very few pain specialists. 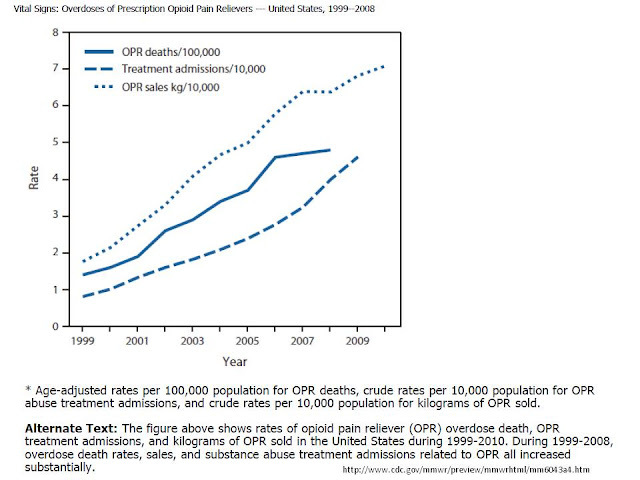 The wide spread prescription of opiate medications for chronic noncancer pain by generalists was uncommon. In many cases if it seemed indicated, the generalist would refer their patient to a pain specialist who would provide them with a letter of agreement on the use of chronic opioids. That all changed with a Joint Commission initiative on pain in 2000. At least some authors see it that way and that was my experience. Since then opioid prescriptions have been taking off with an associated increase in the production of these compounds. This graphic from the CDC is instructive (click to enlarge). The rates of increase of sales, deaths, and treatment admissions are all increasing at an astronomical rate relative to population growth. 1. The genetics of opioid preference: People at risk for abuse and addiction to opioids have intensely positive subjective experiences from taking opioids. People not at risk have intensely negative experiences or the opioids make them physically ill. We currently know nothing about the genetics of this response, but it makes sense to let patients know that if they do have an intensely positive response in terms of feeling euphoric or energetic that is not a good sign in terms of addiction potential. It might even be reasonable to come up with a plan about what to do if that happens. Seeing people back in a month who have no knowledge of this risk is probably not the best plan. It is critical that there is a good therapeutic alliance between the patient and physician and that they are both focused on the full spectrum of problems. 2. The genetics of opioid response: Individuals studies and reviews of studies generally show that a subset of patients respond to opioids. There may be additional factors that should factor into patient selection such as the specific type of neuropathic pain. The current concern and reaction to the opioid epidemic is based on the concept that opioid prescribing is a potentially high risk intervention. If that is the case we need a better options for patient selection than a subjective report of pain. 3. The public perception that opioids are the silver bullet of pain relief must be dispelled: This is the driving force behind escalating doses of opioids and the addition of benzodiazepines (an equally bad idea). Excellent double blind placebo controlled studies of self titrated opioids in chronic neuropathic pain have showed moderate pain relief that is on par with non-opioid medication. 4. Tolerance to analgesia and opioid induced hyperalgesia: Education about these phenomena is needed because both lead to escalating doses of opioids. The dose escalation may be appropriate, but in many cases the dose is increased with the goal of eradicating pain and that is an unrealistic goal. In people who have analgesic induced hyperalgesia, they are often shocked that their pain improves with discontinuation of the opioids. 5. Assessment of functional capacity is critical: Functional capacity is the ability to function in daily life. It must be carefully assessed in anyone who is on chronic opioid therapy. At moderate doses and in combination with other pain medications opioids can impair coordination, cause excessive sedation, and lead to significant impairment in daily functioning. This is a sign that the dose of the opioid may be too high and reducing the dose is indicated. 6. A hierarchical approach to pain treatment is still necessary and is the most rational approach to reducing the current epidemic of excessive opioid prescriptions: If the degree of pain relief across a population is the same, why not use the drug with the lowest abuse and overdose potential? That was the default model in the 1990s in Minnesota. The National Health Service in the United Kingdom has operationalized that as their current pathway for treating neuropathic pain in the algorithm below (click to enlarge). Note that the medications with no abuse potential are at the entry levels in this diagram and that pain specialists are the gatekeepers for opioids. Like most political debates the current debate about how to stop the epidemic of opioid overdoses ignores that fact that the problem may have originated with a political initiative in the first place. Using the NICE algorithm to get us back to the Minnesota practice model of the 1990s is a logical solution. Rowbotham MC, Twilling L, Davies PS, Reisner L, Taylor K, Mohr D. Oral opioid therapy for chronic peripheral and central neuropathic pain. N Engl J Med. 2003 Mar 27;348(13):1223-32. PubMed PMID: 12660386. National Institute for Health and Clinical Excellence. Neuropathic pain: the pharmacological management of neuropathic pain in adults in non-specialist settings. NHS. March 2010.